Some 100 volunteers and family members from the Syria White Helmets civil defence group have been resettled in the UK, the Home Office has confirmed. The White Helmets group has saved more than 115,000 lives in Syria's war zones, according to the UK government. The volunteers were evacuated with the help of the UK last year, when their lives were in danger. One former member told the BBC's Victoria Derbyshire programme his life "had changed completely". Khalil, 30, whose real name we are not using, said he now wanted "to return the favour to the United Kingdom and its people who supported us while I was still in Syria". Immigration minister Caroline Nokes told the Victoria Derbyshire programme the UK had "a really proud history of being a safe haven for refugees". She said the Home Office had asked local councils to volunteer to take in White Helmet members and their families, saying many were prepared to help "across the length and breadth of the United Kingdom". Ms Nokes added that, along with providing funding for English teaching to help those resettled find work in the UK, their children would also be ensured school places and access to healthcare. Watch Catrin Nye's full film for the Victoria Derbyshire programme here. Khalil, who has brought his wife and young children with him, described being in the White Helmets as his "whole life" in Syria. "Often when we were transporting an injured woman, man or child, they would start praying, kissing us and thanking us," he explained. "It was such a beautiful feeling. 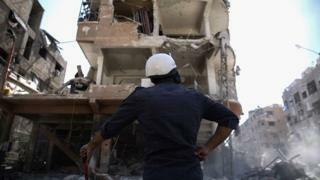 For the people who are trapped in this conflict, the White Helmets was their safety net." The group operates in rebel areas, and is often targeted by the Syrian regime. Khalil was one of 422 volunteers and family members who had to be rescued by the Israel Defense Forces following a request from the US, UK and other European nations, after they became trapped following a military offensive in July 2018. He and his family were brought, via Jordan, to live in the UK - having been vetted and given refugee status before arrival as part of the Vulnerable Persons Resettlement Scheme. He said it came as a shock that "after being threatened by death or arrest, I was now in a safe country". "Here there is freedom, democracy, peace and a multitude of different religions side-by-side," he added, saying he remained worried about the safety of the White Helmets still within Syria. Ms Nokes said the UK government continued to have "enormous concern" for those still suffering because of the war. "I have no doubt that the UK going forward will continue to play its part in global resettlement, that we will provide aid," she said.